Do You Need To Acclimate Your Hardwood Before Installation? No! The hardwood manufacturers would have you believe that you MUST acclimate your wood before the installation. There are good reasons for that but it really isn't a necessity. Installing hardwood in your home adds beauty, durability and value. So you want to install it the right way. Hardwood, being a natural product, used to be a living thing. But now that the tree has been cut down and milled into a flooring product, it still breathes. 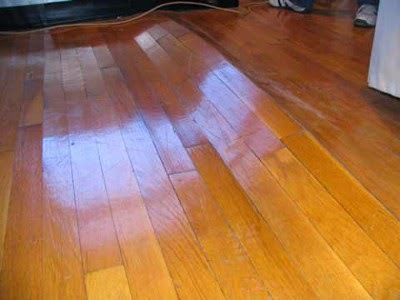 Hardwood will adsorb the moisture from the air and expand. Or in cold weather climates, hardwood will dry out when the air in the home is dry. With a forced air furnace running during the colder months, the air in the home can become very dry. Without adequate moisture in the air the wood will contract (shrink). With prolonged bouts of dryness (dry air) the wood can actually start to crack (this will be a discussion for another day: the importance of keeping the relative humidity in your home at a somewhat constant rate and the benefits of it). But our blog today is on acclimating the wood. Acclimating the wood means having the wood delivered a few days before the actual installation so that it can sit in the home and "acclimate" to the humidity levels in the home. Why is this important? Well, if you bring out the wood to the job site and the moisture content of the wood is over 2% higher than the base floor then this can cause issues. Issues that the hardwood flooring manufacturer know can and will happen. The most common problem associated with non acclimation is this: let's say that the new hardwood flooring that is to be installed in your home has a moisture content of 6.7%. The plywood subfloor that the hardwood is to be installed over has a moisture content of 9.2% (it's been a humid summer). Now when we install the wood flooring, the higher moisture content will wick up into the new flooring. The new hardwood will start to absorb the moisture out of the subfloor. The new hardwood remember has a moisture content of 6.7% and we are installing it tight together on your substrate. In a fairly short time frame the moisture levels of the two floorings (the new hardwood and existing plywood subfloor) will become somewhat equal. The subfloor will lose moisture and the new hardwood will gain moisture. So the new hardwood will now expand. Remember earlier in this blog we explained how wood will expand and contract with differing humidity levels. So now the wood is installed and expanding. There is really no room for the wood to expand. Because we've installed it with a 6.7% moisture level and now it's closer to 8% after installation, you can get buckling of the floor. Remember, the wood is expanding with no place for it to go. This can and will cause flooring failure and the hardwood flooring manufacturers will not honor ANY warranty claims if the wood was not acclimated properly! So why do I say that acclimation is not always necessary? Well basically, if the moisture content of the new hardwood and the existing substrate is within 2% then no acclimation is necessary. For example: the hardwood has a moisture content of 7% and the plywood subfloor has a moisture content of 7.5%. This would be okay. 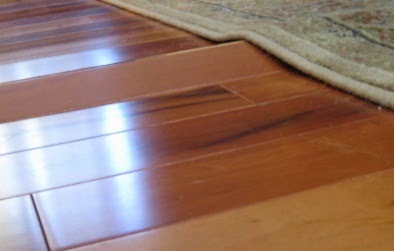 The new hardwood floor can tolerate a 2% variance without any installation issues in most cases. I've always wondered why the hardwood flooring manufacturers would insist on acclimation. My thoughts behind this were based on installing hardwood in the humid summer months here in Michigan. If I brought out the new hardwood to acclimate and the relative humidity in the home/air was extremely high (like over 90%), then why would I want to acclimate the wood. The wood sitting in the home would start to absorb all this moisture and start expanding. Now my 5' wide boards are actually 5.1" wide or more upon installation. This is fine during the humid summer months but in the dry air of winter months, the floor will shrink and gaps will start to form in the flooring between planks. This is especially true on wide boards made of hickory or maple! The secret is to have the new hardwood flooring be within 2% moisture content of the subfloor (thus avoiding any installation issues) AND have the relative humidity in the air to be between 35% and 55%. This is the optimal situation for hardwood flooring installation. I would rather not bring out and acclimate the new hardwood flooring in a home where the humidity is sky high. Rather, we need to bring down the humidity level in the home before acclimation. Running your air conditioner for about a week before installation of your new hardwood will sufficiently dehumidify your home for optimal installation conditions. Now, I'm not saying don't acclimate your hardwood flooring because the fact is the flooring manufacturers will not warranty your flooring if it isn't acclimated. They have found it safer to just say acclimate everything. Whether it's needed or not is irrelevant. Most hardwood flooring retailers won't educate the consumers about the requirements of whole house humidity levels and take the easy way out. Acclimate everything....(if you have shrinking during dry months and gaps between planks, the hardwood flooring manufacturers will just say it's normal but is that what you, the consumer, want?). Acclimate everything. But is it needed everytime? No. If the moisture content in the new hardwood is within 2% of the basefloor then no acclimation is really needed. Soft yarn! The consumers love it. But is it the best yarn for the consumer? First off: how it's made. The fiber manufacturers have worked with the yarn to get smaller and smaller deniers. The smaller the denier the softer the yarn. But how does it perform? Nylon yarn is naturally a high wearing fiber. Very resilient. It will stand up to even the toughest of wear patterns. The smaller deniered yarn is still nylon but because of the inherent softness it will start to mush (is that a technical term? LOL) down and kind of pack together like snow. Because it can do this the appearance can take a hit if the denier is too small (hence softer yarn). Also, there have been complaints industry wide of vacuuming problems with the ultra soft yarns. The fiber manufacturers and the carpet mills have gone to great lengths to educate the flooring sales people and the consumer of the requirement that ultra soft yarns require in a vacuum cleaner. 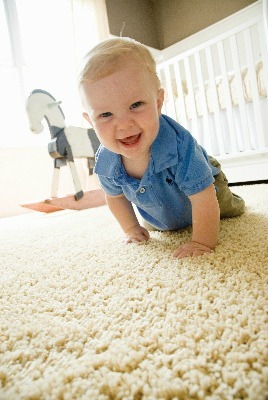 Most vacuum cleaners just don't perform on ultra soft yarns because the yarns are mushing down (not matting). Matting down is quite different from mushing down. A matted carpet can be pulled up and pileated with a good vacuum cleaner whereas the same vacuum cleaner will not pull up the ultra soft yarns. So, what about soft yarns. Overall they are a good product. Soft to the touch, resilient and high wear. Where the jury is still out is in the ultra soft yarns. They don't have the test of time on their side and with the fact that you will probably have to buy a new vacuum cleaner along with the high cost of the ultra soft carpet your initial outlay will be pretty hefty. In our opinion the ultra soft yarns are probably not worth the money you spend on them, the buying a new vacuum factor and the fact that performance is still in question, we prefer to stick with the mid deniered soft yarn systems that will give you higher performance and won't break the bank on a new high end vacuum.